NEW YORK (CNNMoney.com) -- Good news for snail-mailers: No need to keep digging for one- and two-cent stamps because all new first-class stamps will be "Forever Stamps" beginning next month. The U.S. Postal Service has been raising postage rates more frequently in recent years as it tries to dig out a deep financial hole and is hoping to hike the current 44-cent rate in 2011. But under its new policy, which will be formally announced in mid-January, those mailing typical letters won't have to keep up with postage increases. All new stamps good for one ounce of first-class mail will be marked with the "Forever" designation instead of a postage rate and will therefore retain their value, the Postal Service said as it unveiled its 2011 commemorative first-class stamp collection. "Regardless of when the stamps are purchased or used in the new year, no matter how prices may change in the future, these stamps will always be equal to the current First-Class Mail one-ounce price," the service said in a statement. The Postal Service will issue the first stamp, which celebrates the year of the rabbit in the Lunar new year, on Jan. 22 under the new policy. The first Forever Stamp featured the Liberty Bell and was issued in April 2007. 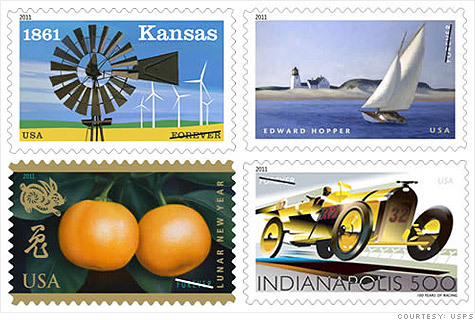 Since then, 28 billion Forever Stamps have been sold, generating more than $12 billion in revenue.